A crazy rare Boba Fett Star Wars action figure is currently on sale for $365,000 plus tax. The toy was on sale throughout the Star Wars Celebration over the weekend and Chicago and, not surprisingly, it didn't sell. 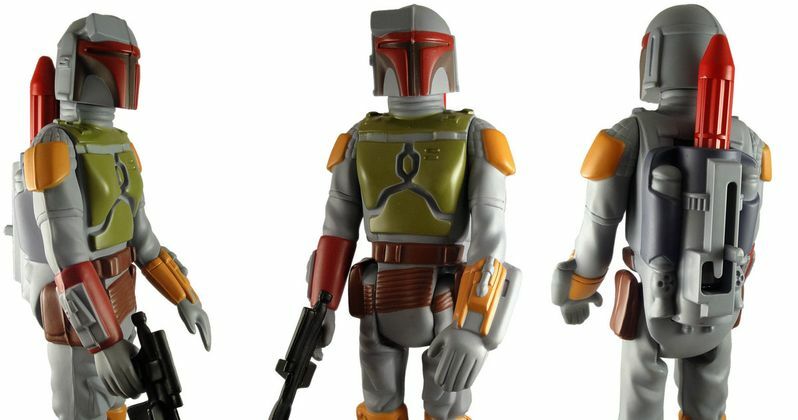 However, there are three of these Boba Fett action figure prototypes known to exist out in the world and they are highly coveted in the world of Star Wars collecting. It could very well fetch that astronomically high price in the near future if the right buyer is found. This particular Boba Fett action figure comes with a famous backstory. Back before the iconic character was even introduced in The Empire Strikes Back, Kenner put an offer on some action figures allowing fans to send in a proof of purchase and receive a free Boba Fett figure with a rocket launcher attached to his back that actually fired the little projectile. However, Kenner later changed their mind about firing a projectile after choking and eye injuries seemed like a possibility. So, the figures were sent off as promised, but they did not include the working rocket launcher. Young Star Wars fans were understandably angry, but life went on. Brian Rachfal, a longtime collectibles dealer, was one of those children and is now selling the rare prototype after being asked by a private collector to help get rid of it. It's believed that only 100 prototypes were made, with about 30 still known to be an existence. However, this isn't the one Rachfal currently has for sale. Instead, he has one of maybe three in the world, which includes a copyright stamp, meaning this design was nearly okayed and sent off to the factory to be mass produced. Brian Rachfal's Boba Fett action figure prototype is also notable for having a different L-shape firing mechanism, while the rest have a J-shape. One of the normal versions of the toy fetched $86,383.47 at a recent auction, but it doesn't have the copyright stamp on the leg, which means Rachfal's price might not be as high as everybody thinks it is. Star Wars fans aren't the only people buying this kind of piece because it is considered to be an investment. Steve Sansweet, who runs the Rancho Obi-Wan museum knows a thing or two about the market and believes Rachfal might be able to get close to his asking price. Steve Sansweet believes he has one of the same Boba Fett prototypes, but he is unsure of having the copyright stamp. That's something he may want to find out as soon as possible, especially considering he has had stuff stolen from him over the years. Brian Rachfal had the figure up at Star Wars Celebration over the weekend and people were interested, mainly because of the story behind it. For people of a certain age, they can remember the excitement of getting the figure in the mail and the disappointment after finding out it wasn't as advertised. Entertainment Weekly was the first to report about the Boba Fett action figure selling for $365,000.